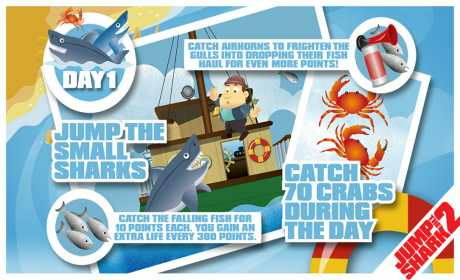 You are the captain of a fishing boat on an 5 day trip, follow the map and try to beat all the creatures and mini-challenges to make it to the end of the voyage. 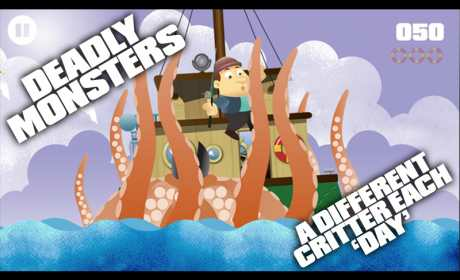 There are things to help you on your trip, but watch out, as day turns to night the sharks really start to get hungry … and there are much bigger things lurking in the depths! A simple yet addictive game, with in-game mini challenges, beat the clock sections and trips below the surface in the shark cage into the the creatures domain to keep you entertained. Jump The Shark 2 features hungry sharks, giant squids, biting barracuda, prehistoric piranha, killer whales, the snapping jaws of the Great White Shark and a mystery monster from the depths! 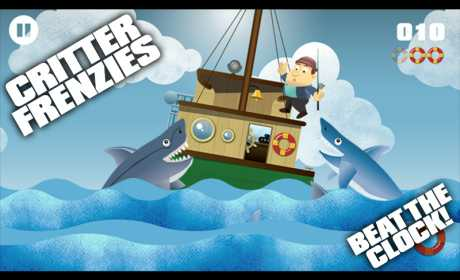 If you like shark games you will LOVE! !